THIS IS THE FOURTH PAGE OF DOCUMENTS FOR THE FIRST HALF OF 1928 on Nicaragua's Caribbean Coast region, housing materials dated during the 11 days from April 16-26 — eleven dramatic and event-filled days when Sandino's forces plunder and all but destroy the La Luz & Los Angeles mines in the Pis Pis mining district. The flurry of radiograms & missives continues into the next pages, as the Marines & Guardia scramble to detect and track the elusive rebels in the wake of their surprise assault on the mines. 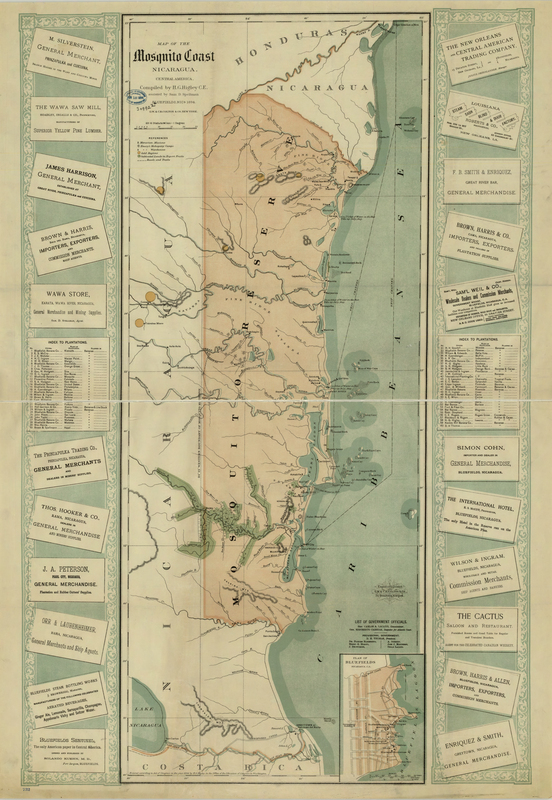 Among the most notable documents below are F. C. Englesing's April 19 message to Major Utley providing information on the mining district and its trails, including his sketch map of the Neptune Mine and his comments about the zone's political geography: "The inhabitants are all Liberals and Moncadistas and have no great love for American troops [and] are absolutely untrustworthy. The Indian tribes, at the first hint of any trouble in their neighborhood, will promptly take to the bush, aiding neither side." Major Utley's 4-page "Weekly Report of Events" of 22 April includes a blow-by-blow account of the flurry of radiograms & notes, while his intelligence report of the same date offers the accurate assessment that the rebels "should have no difficulty in obtaining recruits in this sector where the prevailing sentiment is pro-Sandino." The 25 April article in the Philadelphia Evening Bulletin includes four rare (if poor quality) photos of the mining district provided by Mr. Wharton Huber, the associate curator of the Academy of Natural Sciences in Philadelphia, who had visited the area not long before. In the audacious EDSN assault on the mining districts one sees the first shock waves of this emergent revolution from without. 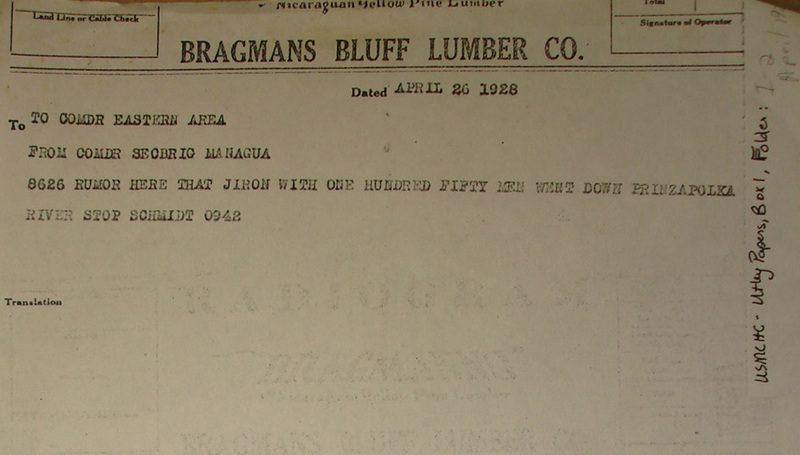 Report of Brigade Inspector (excerpt), Puerto Cabezas re Bragmans Bluff Lumber Co. "Puerto Cabezas. (From report of Brig Inspector). 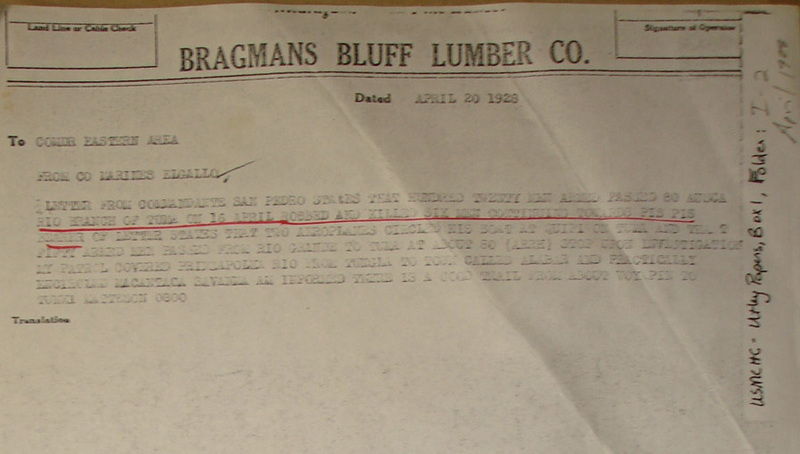 ¶ The Bragmans Bluff Lumber Company has a concession from the Nicaraguan Government covering the territory in the vicinity of Puerto Cabezas. Their operations consist in raising and shipping bananas to the extent of about twenty-eight or thirty thousand stems weekly, and cutting, milling and shipping pine lumber, representing an investment of about twelve million dollars. The money and other valuable property located in Puerto Cabezas would be the most tempting to bandits but it is situated at a great distance from the present bandit activities." Radiogram, B. Evans, Tunki, to F. C. Englesing, Neptune Mine. "TO MR. ENGLESING ¶ FROM B. EVANS - TUNKI ¶ WE HAVE FAIRLY RELIABLE INFORMATION THAT A COUPLE HUNDRED BUSHWACKERS ARE A DAY AWAY FROM HERE. TAKE DUE NOTICE THEREOF AND GOVERN YOURSELF ACCORDINGLY. THEY ARE COMING IN FROM THE DIRECTION OF LA LUZ. TWENTY LEATHERNECKS HERE. ¶ B. BROWN"
Radiogram, Capt. 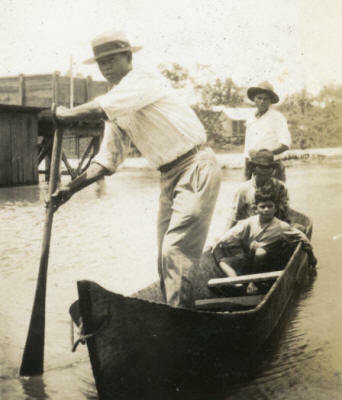 Tebbs, Tunky, to Major H. H. Utley, Puerto Cabezas. "TO COMDR EASTERN AREA ¶ FROM CO MARINES TUNKY ¶ 8616 YOUR 8610 1105 RECEIVED STOP HAVE INFORMATION HERE ARE BANDITS WITHIN FIFTEEN MILES OF HERE BAND WORKING IN DIRECTION OF EDSON STOP LEFT TO INTERCEPT THEM YESTERDAY BUT RETURNED WHEN I HEARD THEY WERE BETWEEN ME AND TUNKY STOP WILL START AFTER THEM AS SOON AS I GET RELIABLE INFORMATION STOP TRAILS VILE AND NO PACK ANIMALS AVAILABLE EXCEPT THREE HORSES WHICH WE HAVE ABOUT WORN OUT STOP TEBBS 0900"
Radiograms to & from La Luz & Neptune Mines (copies). "April 15, 1928 ¶ A. E. Ingram, Tunkey. ¶ Dear Eden: ¶ We are expecting Sandino in here this afternoon, and a bunch of us are coming out. Please have boats up to carry 8 or 10 people and in case there’s any trouble at TUNKEY before we arrive try to send word up the river and have a signal of some kind out so we won’t run into a trap. ¶ Yours truly, A. H. HEAD, Supt. -------------- La Luz Mine, Nic. C.A. ¶ April 15, 1928 ¶ L. Elizondo & Co. Inc. ¶ Dear Sirs: ¶ I send the bearer, Wing Long, to advise you as follows: On the evening of the 12th inst. Some 200 armed men of the Sandino forces arrived at the LA LUZ MINE and took complete possession of everything, inclusive of all employees: that night and next day 13th. General Giron, and staff took all moneys, gold amalgam, merchandise and live stock, as well as the Acting Supt. Mr. G .B. Marshall. They left on the evening of the 13th for the Neptune Mine they said, on the way to Puerto Cabezas. They stated that they would return and do worse damage. ¶ This evening a runner arrived from the overland route to MATAGALPA and reported a force of about 280 armed Sandino men on the way over here, they are killing all the people on the way, men, women, and children and burning houses right and left: at the rate they are traveling they can arrive at this place (LA LUZ MINE) tomorrow, hence this urgent message for aid. No boats arriving at AMPARO I send this overland with some difficulty, as all mules, etc/, were taken away. ¶ Please advise Mr. Amphlett immediately and warn him unsafe to come river now: it is advisable to send aid immediately. ¶ Kindly advise the Bluefields Mercantile Co., at earliest opportunity so that they may advise our new York Office of this matter without loss of time and also report to authorities in BLUEFIELDS, as the matter is extremely urgent: I trust that you will use your best efforts in this matter, and oblige. ¶ Very truly yours, A. H. Brown. ¶ P.S. 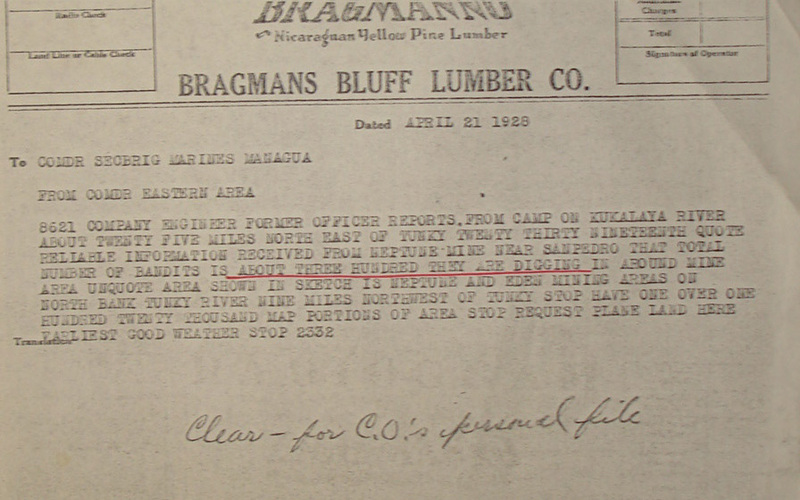 Send this original letter to the Bluefields Mercantile Co. -------------- Tunky, April 16, 1928. ¶ My Dear Englesing: ¶ We have fairly reliable information that a couple hundred bushwhackers are a day away from here. Take due notice thereof and govern yourself accordingly. They are coming in from the direction of LA LUZ. Twenty leathernecks here. ¶ B. Evans. -------------- Camp No. 25, Party 2, ¶ April 17, 1928. ¶ MEMO TO: Maj. Utley (thru Mr. C. R. Byron) ¶ Your letter to Capt. Tebbs forwarded to TUNKY by messenger with instructions to see to its delivery. Messenger not yet returned. ¶ On April 6 a party of 6 men passed on the PIS PIS trail going westward. All were in poor condition. Had feet wrapped in sacking instead of shoes. No packs. All armed with revolvers but no ammunition. Information reliable. ¶ The sentiment of the people in this area is violently pro-Sandinista and consequently anti-American. Or I should say “anti-Marine Corps”. ¶ As far as known there has been no travel east or west since April 6. ¶ F. C. Englesing." Letter from Capt. D. J. Kendall, Bluefields, to Major H. H. Utley, Puerto Cabezas, p. 1. "Dear Major Utley: ¶ After receiving your two radios in regard to commissary dry stores we carefully went over your inventory of April 1st and found that you are over your allowance for 125 men for 90 days on most items. You are however short for some items and these we are requisitioning immediately by radio together with reserve supply of small items for patrols. We have tried before to get small items but have had little success but this time I will try and go into detail enough to get action on them. I am enclosing herewith a table of your allowance and your supply according to your inventory of April 1st together with a list of your overages and underages from the allowance. ¶ Inasmuch as I don’t suppose you will be able to get down here for some time I am going to make a few recommendations that I think should simplify matters of supply and administration. In the first place it seems to me that there is considerable extra work and communication involved in having the quartermaster and paymaster and company headquarters to far separated from your headquarters. For instance we just got an invoice from the Marine Barracks, Coco Sola for 6000 cartridges cal 45, 100 L targets, and 25 E targets. We have 15 target frames, 50 targets of each kind, pasters, spotters and etc. on hand here which we could have shipped you if we had known you were ready for them. We also shipped you 4,000 rounds of pistol ammunition which must have reached you before this stuff from Coco Sola did. This requisition was issued to 1st Sgt. Green of the Galveston and invoiced to me. The first I knew about it was when we received the invoices. We don’t know yet if you have received the material or if it went to the Galveston. I am not signing the invoice until I find out what was done with the material. If the Q. M. had been there in Puerto Cabezas the stuff would have been in the storeroom and could have been issued out when you wanted it if it was yourself that requisitioned it instead of getting this extra from the Canal Zone. It is difficult enough with the personnel. We have to account for our own requisitions without taking up also requisitions of which we have no previous knowledge until the invoice is received. Then again Sage is expecting to start his police force here before the end of May and he will need some more room and is agitating for the basement of the Palace. We could move out and give it to him if we had only the company storeroom here as I could easily fix up a place in the Barracks or under the floor of the Barracks for a company storeroom. Shearer is also anxious to move the Q.M. and P.M. to Puerto Cabezas and of course the company office would have to be there with the records also. ¶ If you approve of the idea I could get along alright here with Cooke and Carroll if I am left here in this area. By sending Sgt. Gaines, an old timer who came in with Capt. Matteson’s detail from New Orleans to El Gallo with Cooke I am sure that he would get along all right. Carroll could hold down this place when I am out in the hills or inspecting some of the outposts. As it is now both Carroll and myself know this area better than any other and it seems a waste to send us elsewhere and have to learn the country and people over again . . . "
Letter from Capt. D. J. Kendall, Bluefields, to Major H. H. Utley, Puerto Cabezas, p. 2. " . . . I was thinking very strongly of sending my wife home this Saturday and making the first Sergeant, Pvt. Miller and the officers move into Barracks where all hands will be available at all times for whatever may happen. There are some rumors though that the tour of duty is extended to 30 months and if that is the case I don’t intend to send my wife home until it is necessary as I could last for 6 months but couldn’t very well face a year’s stay here without her unless actually necessary. ¶ Sage and myself both think now that the McCoy law is going into effect that Marines should be in Bluefields until after the election at least so we are trying to get together on some scheme to house both outfits here. I think he will want to move his police force over here within a month as the natives are clamoring for the guardia to take over again as the police have started mixing in politics a bit once more. ¶ The Commandant of Prinzapolka wrote me the twelfth that Orroliga had come to Siuna with 5 or 6 men only one of them with a rifle and was looking for more men and arms to go to Matagalpa to join Sandino. The intelligence report of 24 March received today from the interior says that Sandino has lost about half of his outfit and they seem to be breaking up into small bands. Also states that many of the discharged men from Puerto Cabezas are passing through Tuma, and makes some mention of rumors of trouble brewing in Chontales. ¶ To date there has been no definite information from Chontales but as soon as I finish turning over to Shearer I am going to take a boat and push up the Siquia as far as possible and see what is going on up there and build up my fences for information and arrange to get prompt notification if anything starts there. ¶ The survey and the expenditure of quartermaster property is going to run into more money than I had expected but we have had very few things surveyed in the 15 months we have been here so I hope it will go through. We did try to hold a survey several times in the past two months but couldn’t get the officers for it at the time when we had the stuff ready, and papers made out. ¶ Am sending on this Ultramar three cases Chesterfields at cost price. It is going to make things very hard to keep the stock up when the Puerto Cabezas profits will all be spent for amusements as with the increased number of men we should have more capital to supply the stock. Whereas the profits from the increased number of men will all be spent and nothing will come into the business again to buy the extra stock with. But we will try and get along somehow and pay our bills. The men in this sector will get nothing from the club for some time to come as all the profits will have to go right back into the business to build up the capital for supplying the extra stock to Puerto Cabezas for which we will get no return as all the profits from it will be spent there. If the extra men enabled us to get stock cheaper and get better discounts from greater quantities ordered it would be all right but it won’t work out that way as we still can’t buy in quantities large enough to get bigger discounts and particularly so when we will only have money enough to buy from hand to mouth. Please forward at the first opportunity the cash on hand in the Club as there should be quite a bit of it and it is needed to pay for stock, already purchased . . . "
Letter from Capt. D. J. Kendall, Bluefields, to Major H. H. Utley, Puerto Cabezas, p. 3. " . . . I understand that the boat stove which we shipped to Puerto Cabezas has never been used. If such is the case please return same here as the small patrols we sent out from here can use it very nicely. ¶ We received a radio to the effect that the radio sets ordered were shipped by express from Frisco to New Orleans for further shipment to Bluefields. As soon as they arrive will make the shipments to effect the redistribution as indicated in your letter. ¶ With no more for the present, ¶ With best wishes, ¶ Kendall"
Radiogram from F. C. Englesing, Camp No. 25, Party 2, to Major H. H. Utley, Puerto Cabezas (through Mr. C. R. Byron). "YOUR LETTER TO CAPT. TEBBS FORWARDED TO TUNKY BY MESSENGER WITH INSTRUCTIONS TO SEE TO ITS DELIVERY. MESSENGER NOT YET RETURNED. ON APRIL 6 A PARTY OF 6 MEN PASSED ON THE PIS PIS TRAIL GOING WESTWARD. ALL WERE IN POOR CONDITION. HAD FEET WRAPPED IN SACKING INSTEAD OF SHOES. NO PACKS. ALL ARMED WITH REVOLVERS BUT NO AMMUNITION. INFORMATION RELIABLE. THE SENTIMENT OF THE PEOPLE IN THIS AREA IS VIOLENTLY PRO SANDINO AND CONSEQUENTLY ANTI-AMERICAN. OR SHOULD I SAY 'ANTI MARINE CORPS'. AS FAR AS KNOWN THERE HAS BEEN NO TRAVEL EAST OR WEST SINCE APRIL 6." 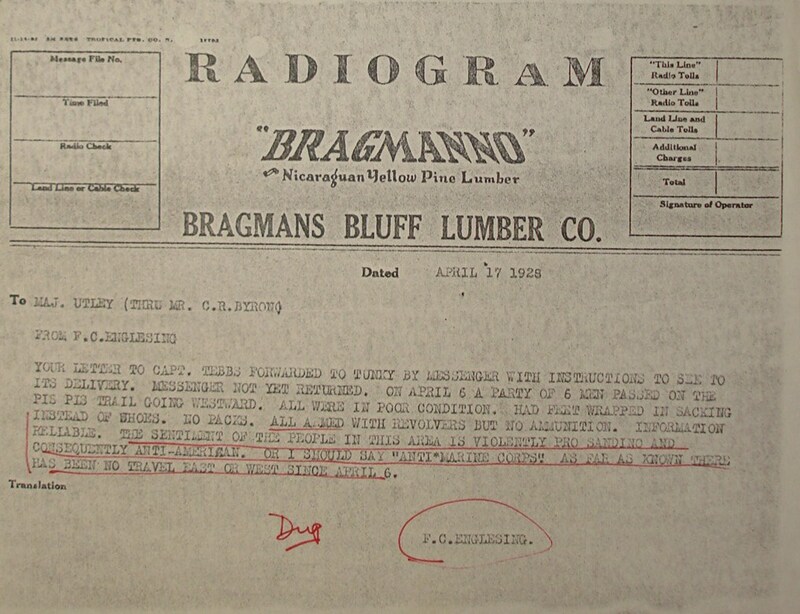 Radiogram from Capt. 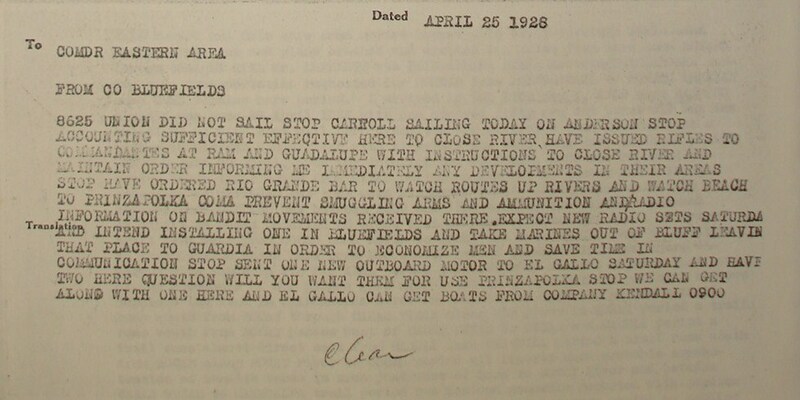 M. A. Edson, Wanks River Patrol, to Major H. H. Utley, Puerto Cabezas. "8618 ESTABLISHED OUTPOST SANG SANG SEVENTEENTH STOP PATROLS SEVEN ENLISTED AND EDSON STARTED AWASBILA AFTERNOON SAME DATE STOP CAPSIZED HALF MILE ABOVE HERE STOP PERSONNEL OK LOST ONE BAR TWO RIFLES TWO HUNDRED RATIONS ONE CASE RIFLE AND TWO HUNDRED PISTOL AMMUNITION FOUR PACKS COMPLETE AND CLOTHING OF MEN IN PATROL STOP MOTOR SLIGHTLY DAMAGED BATEAU LOST STOP RUMORS FORCE EXPECTED AWASBILA IN TWO DAYS BOAT MEN CHOW ( ? ) (sic RETAKEN UP RIVER LOST ( ? ) (sic) NOT YET RETURNED STOP PATROL EXPECTED TO LEAVE OVERLAND AWASBILA THIS PM STOP EXPEDITE SHIPMENT ARMS CLOTHING LOST AND ADDITIONAL RATIONS STOP RECOMMEND ENTIRE DENVER DET THIS RIVER STOP MOSIER (DY SENT ARYO THESE GIC) EDSON 0800"
Radiogram from F. C. Englesing to Major H. H. Utley (through Mr. C. R. Byram). "RELIABLE INFORMATION RECEIVED FROM NEPTUNE MINE NEAR SAN PEDRO THAT TOTAL NUMBER OF BUSHWACKERS THERE IS IN THE NEIGHBORHOOD OF 300 THEY ARE REPORTED AS DIGGING IN AROUND THE MINE AREA. THE FOLLOWING SKETCH OF THAT AREA MAY PROVE HELPFUL. I REMAIN IN OBSERVATION. ¶ F. C. ENGLESING"
Radiogram no. 2 from F. C. Englesing to Major H. H. Utley (through Mr. C. R. Byram). "IT IS RUMORED THROUGH THE DISTRICT THAT THE MARINE DETACHMENT OPERATING TUNKI HAS WITHDRAWN DOWN THE RIVER TOWARD THE COAST. ALSO THAT THE BAND PREIOUSLY REPORTED FROM LA LUZ MINE A WANI HAS ARRIVED AT AND LOOTED THE NEPTUNE MINE AT THE PIS PIS. I HAVE HOWEVER NO CONFIMRATION OF EITHER REPORT AS MY MESSENGER TO CAPT. TEBBS WHO CARRIED YOUR LETTER HAS NOT RETURNED. AS A PRECAUTIONARY MEASURE I HAVE ESTABLISHED AN OUTPOST ON THE TRAIL WESTWARD IN THE DIRECTION OF TUNKY. IT WILL REMAIN IN OBSERVATION AND AT WORK UNTIL COMPELLED BY ANY SUPERIOR FORCE TO RETIRE. FOR WHICH EMERGENCY I HAVE MADE PREPARATIONS ON THE KUKALAYA RIVER. ANY FURTHER INFORMATION OBTAINED WILL BE FORWARDED TO YOU. ¶ F.C. ENGLESING." Information furnished by Mr. Englesing, Regarding Trails, p. 1. "In the mining are around San Pedro de Pis Pis, there is, at the present time only one mine in operation which is worked by the Receiver, Mr. Springer of Bluefields, Nicaragua. This mining area communicates by trail with both the west and east coasts. The west coast routes lie through BOCAY and MATAGALPA. The MATAGALPA trail, connecting with that from WANI and the LA LUZ mine (which is still operated by Mr. Fletcher of Philadelphia), runs in a southwesterly direction, usually keeping to the valleys between high mountain ranges of from 2,000 to 3,000 feet altitude. The country in this direction is all heavily wooded and sparsely populated. There is, however, an abundance of forage for pack animals, which must be used to the exclusion of any other form of transportation. In the dry season the journey from SAN PEDRO DE PIS PIS to MATAGALPA maybe made in eight (8) days, and in the wet season, by extraordinary efforts, in ten (10) days, but is more usually traversed in two weeks to twenty days. ¶ Of this BOCAY trail very little is known by the writer except that it follows the general course of the GUABUL CREEK and is passable only to pack animals. A third trail from SAN PEDRO DE PIS PIS leads northward, following the general course of the WASPOOK RIVER to the junction with the WANKS and thence into HONDURAS. This trail passes through practically all of the villages of the SUMO Indians living along the banks of the WASPOOK, and can be traveled only by pack animals. The journey in the dry season, from SAN PEDRO DE PIS PIS to the WANKS taking about a week and in the wet season from ten (10) days to twelve (12) days. Eastward from SAN PEDRO DE PIS PIS a single trail lies down the valley of the TUNKY RIVER to its junction with the BAMBANA at the town of TUNKY. In its last stages (within about six (6) miles of TUNKY, this trail divides into three branches, one leading almost directly to TUNKY, the second to the MINESOTA MINE (Abandoned), an old Spaniard (European), by the name of BUSTEMUNTE, where it connects with the main trail by way of SAN LUIS DE OCONGWAS and TILBALUPIA on the KUKALAYA RIVER to a junction with the railroad line of BRAGMAN’S BLUFF LUMBER COMPANY, near SANTA CRUZ. In addition to these there are new tails connecting with the old one at SAN LUIS DE OCONGWAS, and runs in a more direct line to the railroad above mentioned, as a place known as BROWN’S CAMP. These trails are all suitable for pack animals in the dry season, but in the wet, the old trail by TILBALUPIA cannot be used on account of the extensive swamps on both sides of the KUKALAYA RIVER. The new trails mentioned above are very much better and can be used in both the wet and dry seasons. Almost all streams encountered on these trails are fordable, except only the KUKALAYA RIVER in the wet season . . . "
Information furnished by Mr. Englesing, Regarding Trails, p. 2. " . . . From TUNKY a trail runs southward, on the eastern side of the general mountain range of mountains to WANI, making two lines of communication between that place and the SAN PEDRO DE PIS PIS MINES. ¶ On all of the above trails it is generally necessary to move to single file but occasionally in the dry season, they may be moved to columns of two, never more. It is generally advisable to use mules for transportation in the dry season and oxen in the wet, the latter being slower but better able to stand the strain of working in the mud. ¶ Other routes of communication with the PIS PIS district are by water, by the way of the PRINZAPOLKA and BAMBANA RIVERS, which may be navigated by cargo boats, with outboard motors, carrying up to 3,000 pounds each. The KUKALAYA may also be navigated in the same manner, and usually, in its lower stage, has more water than the two above mentioned rivers. From this water route connection can be made both through TILBLUPIA and points at intersection on the newer trails in the mining district. ¶ From the town of WANI, near which is the location of the LA LUZ RIVER, the already described trail leading to MATAGALPA forms the sole means of communication to the east, and the trail north to TUNKY the only line of communication is that direction. There are, however, Indian trails leading down the PRINZAPOLKA RIVER by way of the Indian villages along its banks, but this is not generally used as a means of through communication. Practically all travel being carried on by means of the PRINZAPOLKA RIVER. The trails to be east are, as a general rule, very poor. ¶ The marching distances from WANI to MATAGALPA is eight (8) days; from WANI to TUNKY one (1) day; from WANI to SAN PEDRO DE PIS PIS one (1) day; from SAN PEDRO DE PIS PIS to BOCAY two (2) to four (4) days; from SAN PEDRO to the mouth of the WASPOOK four (4) to six (6) days; from SAN PEDRO DE PIS PIS to TUNKY one (1) day; from SAN PEDRO DE PIS PIS to SAN LUIS DE OCONGWAS one and one-half (1 ½) days; from SAN LUIS DE OCONGWAS to TILBALUPIA one and one-half (1 ½) days; from TILBALUPIA to SANTA CRUZ three (3) days; from SAN LUIS DE OCONGWAS by new trail, to the KUKALAYA RIVER one (1) day; from KUKALAYA RIVER to the RAWAWAS one (1) day; and from RAWAWAS to the railroad two (2) days. ¶ The marching distances shown above, where two are given, the greater indicates the time for the rainy season, and the smaller that for the dry. ¶ Food supply for all this region is very scarce. The scattered inhabitants living only on bananas and yuca, with an occasional cow or pig. It would be almost impossible to maintain any large body of men for any length of time in this district. This applies to both native as well as American troops. ¶ The inhabitants are all LIBERALS AND MONCADAISTAS and have no great love for American troops, and for sources of information of guiding purposes are absolutely untrustworthy. This applies to the Spanish speaking population. The Indian tribes, at the first hint of any trouble in their neighborhood, will promptly take to the bush, siding neither side. ¶ There is an abundance of water in all this area . . . "
Radiogram from Capt. C. P. Matteson, El Gallo, to Major H. H. Utley, Puerto Cabezas. 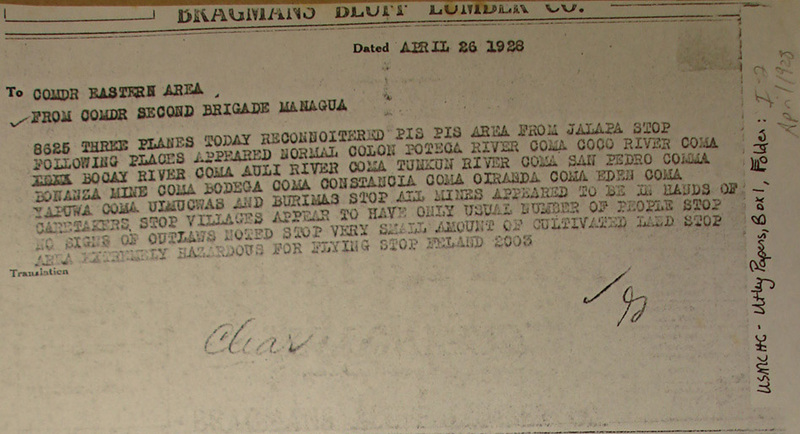 "LETTER FROM COMMANDANTE SAN PEDRO STATES THAT HUNDRED TWENTY MEN ARMED PASSED 80 CASCA RIO BRANCH OF TUMA ON 16 APRIL ROBBED AND KILLED SIX MEN CONTINUED TOWARDS PIS PIS BEARER OF LETTER STATES THAT TWO AEROPOLANES CIRCLED HIS BOAT AT QUIPI ON TUMA AND THAT FIFTY ARMED MEN PASSED FROM RIO GRANDE TO TUMA AT ABOUT 80 (ARRH) STOP UPON INVESTIGATION MY PATROL COVERED PRINZAPOLKA RIO FROM TUNGLA TO TOWN CALLED ALABAR AND PRACTICALLY ENCIRCLED MACANTACA SAVANNA AM INFORMED THERE IS A GOOD TRAIL FROM ABOUT VOYAPIN TO TUNKI MATTESON 0800"
21 April 1928 (0200; exact date unknown). Letter from Benjamin C. Warnick, President, Bonanza Mines Co., Philadelphia, to Sec. State, Washington D.C. "Dear sir: ¶ I beg to inform you that I this day received a telegram informing me that Sandino’s forces have looted our mines and taken our superintendent prisoner. Please inform me fully about this matter and what steps if any you are taking to protect our operation and property. Your full and prompt reply will greatly be obliged, ¶ Yours very truly, ¶ Benj. C. Warnick, President." 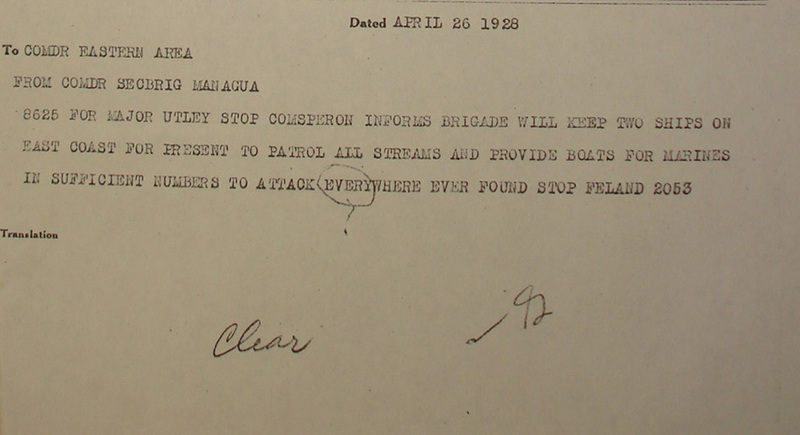 Weekly Report of Events, Major H. H. Utley, Puerto Cabezas, p. 1. "Map used: MAPA COMMERCIAL DE NICARAGUA, Scale 4 3/8” – 30 mi. ¶ Location of outpost: WAWA CENTRAL, SACHLIN, WASPUC, and SANG SANG. ¶ Location of main body: PUERTO CABEZAS. ¶ Patrols sent out to: 18th: Cpl. PORTER and pack train guard returned from SACHLIN at 1830. ¶ 20th: Captain TEBBS’ patrol returned from TUNKI at 1620 via PRINZAPOLKA River to PRINZAPOLKA and thence by schooner to PUERTO CABEZAS. ¶ 20th: Captain TEBBS with patrol of 24 men left for BROWNS CAMP at 2300. ¶ Duty performed: Reconnaissance, preservation of order, search for arms and ammunition, prevention of recruiting by bandits, and forestalling their procuring supplies (blocking WANKS and WASPUC rivers). ¶ Condition of trails: Bad around PIS PIS section. ¶ Ammunition on hand: Rifle: 27,500; MG: 2,250; Pistol: 13,000. ¶ Rations on hand: 10 days, except fresh vegetables received weekly from States. (Rations issued to patrol to May 22nd not included in above.) ¶ Health of troops: Good. ¶ Orders received: B.O. #33, #38, #40, and Memo. #4. ¶ Messages received: ¶ 16th: Message from WANKS RIVER PATROL: 'Two armed men in SACHLIN Friday 6th evidently getting information. Were told by natives marines expected same date and sent up river that afternoon. Rumors six armed men in LIMOS about same time. Force which raided SANG SANG has evidently gone back up river. Took with them six large batteuas and three large pitpans, capacity about seventy-five besides Indians and crew. With boats used coming down river now have means of transporting one hundred. Believe probable to expect their return 20th, depending on pressure exerted by DUNLAP’s forces. Will establish outpost at SANG SANG and AWAWAS.' . . . "
Weekly Report of Events, Major H. H. Utley, Puerto Cabezas, p. 2. " . . . 17th: Message from TUNKI PATROL: ‘Your 8606-1015 and 8606-1020 received at 0060 while enroute to BONANZA Mine. Turned back to TUNKI immediately. Taking all precautions and will take strong patrol out tomorrow and try to get information and gain contact with armed band. All apparently quiet there and no rumors.’ ¶ 18th: Radio from SECBRIG: ‘Your 8618-0915 from QUILALI and TUMA as bases patrols are operating eastward. Aviation well beyond patrols reports no signs of outlaw activities or groups and that country is a wilderness.’ ¶ 18th: Radio from SECBRIG: ‘Jefe Politico OCOTAL reports native rumors that discontented negroes from northeast coast traveling west to join SANDINO. 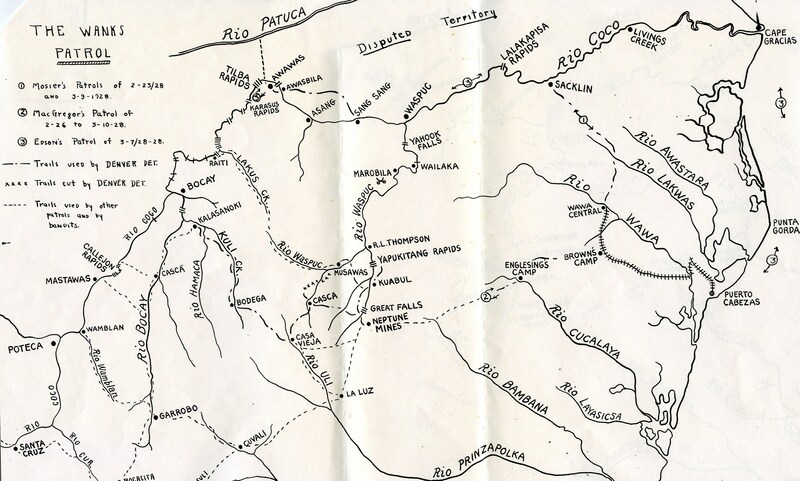 Report that bandits left YAUSCA for plains of MACANTACA north of TUMA in PRINZAPOLKA.’ 19th: Message from TUNKI PATROL: ‘Have information here bandits are within fifteen miles of here, band working in direction of EDSON. Left to intercept them yesterday but returned when I heard they were between me and TUNKI. Will start after them as soon as I get reliable information. Trails bad and no pack animals available except three horses which we have about worn out.’ ¶ 19th: Memorandum from Mr. ENGLESING: “On April 6th a party of six men passed on the PIS PIS trail going westward. All were in poor condition. Had feet wrapped instead of wearing shoes. No packs, all armed with revolvers but no ammunition. Information reliable. The sentiment of the people in this area is violently pro-Sandino and consequently anti-American. Or I should say ‘anti-Marine Corps.’ As far as known there has been no travel east or west since April 6th.’ ¶ 19th: Memorandum from Mr. ENGLESING: ‘Reliable information received from NEPTUNE Mine near SAN PEDRO that the total number of bushwhackers there is in the neighborhood of three hundred. They are reported as digging in around the mine area.’ ¶ 19th: Note to Mr. ENGLESING from M. B. EVANS, TUNKI: “We have fairly reliable information that a couple hundred bushwhackers are a day away from here. Take due notice thereof and govern yourself accordingly. They are coming in from the direction of LA LUZ. Twenty Leathernecks here.’ ¶ 19th: Letter from A.M. BORNW, LA LUZ Mine to L. ELIZONDO & CO., PRINZAPOLKA: ‘I send the bearer WING LONG, to advise you as follows: ‘On the evening of the 12th inst., some two hundred armed men of the Sandino forces arrived at the LA LUZ Mine and (armed men) took complete possession of everything, inclusive of all employees. That night and next day 13th, General GIRON and staff took . . . "
Weekly Report of Events, Major H. H. Utley, Puerto Cabezas, p. 3. " . . . all moneys, gold amalgam, merchandise and livestock, as well as the Acting Superintendent, Mr. G.B. MARSHALL. They left on the evening of the 13th for the NEPTUNE Mine, they said on their way to PUERTO CABEZAS. They stated that they would return and do worse damage. This evening a runner arrived from the overland route to MATAGALPA (15th) and report a force of about 280 armed SANDINO men on the way over here, they are killing all the people on the way – men, women and children, and burning houses right and left; at the rate they are travelling they can arrive at this place (LA LUZ Mine) tomorrow, hence this urgent message for aid. No boats arriving at AMPARO I send this overland with some difficulty, as all mules, etc., were taken away. Please advise Mr. AMPHLETT immediately and warn him unsafe to come up river now. It is advisable to send aid immediately.’ ¶ 19th: Letter to A. E. INGRAM, TUNKI from A. H. HEAD, Supt., BONANZA Mines: ‘We are expecting SANDINO in here this afternoon and a bunch of us are coming out. Please have boats up to carry eight or ten people and in case there is any trouble at TUNKI before we arrive, try to send word up the river or have a signal of some kind out so we won’t run into a trap.’ ¶ 20th: Radio from EL GALLO: ‘Letter from Commandante SAN PEDRO states that hundred twenty men armed passed YAUSCA RIO branch of TUMA on 16 April, robbed and killed six men continuing towards PIS PIS. Bearer of letter states that two aeroplanes circled his boat at QUIPI on TUMA and that fifty armed men passed from RIO GRANDE to TUMA. Upon investigation my patrol covered PRINZAPOLKA RIO from TUNGLA to town called ALABAR and practically encircled MACANTACA SAVANNA. Am informed there is a good trail from about VOYAPIN to TUNKI.’ ¶ 21st: Radio from CO BLUEFIELDS: ‘Has MATTESON been informed of developments. ALFARO informed me SANDINO was at LA LUZ Mine day before yesterday and part of his force headed towards SAN PEDRO DEL NORTE.’ ¶ 21st: Radio from SECBRIG: ‘Received what is considered reliable information. There are one hundred fifty bandits with four machine guns now at YAUSCA. Believe SANDINO with this band.’ ¶ 21st: Radio from SECBRIG: ‘Reports coming in that SANDINO and followers are in PIS PIS Area. Planes planning to reconnoiter area as weather permits basing on JUNOTEGA. Make every effort to deny outlaws receiving supplies, ammunition and re-enforcements. KENDALL at BLUEFIELDS instructed to question ERNESTO ALFARO who is alleged to have been in PIS PIS recently. Keep me well informed and radio full report of TEBBS when he returns from PIS PIS Area.’ . . . "
Weekly Report of Events, Major H. H. Utley, Puerto Cabezas, p. 4. " . . . 21st: Note to Mr. CRAMPTON from FLORES, SANDY BAY: ‘TASPAPONEY; FREDDIE HAM carrying three hundred rifles and about two thousand rounds of ammunition. He told this to PHILIX, and threatened his life to his face. SISSING: There is a man there by the name of HAROLD PENUCK who is also carrying arms and ammunition. Plenty. AUSRARA: There is a man there by the name of ELISIO MATHEW that had his home full of arms and ammunition and also eight machine guns carried from BAMONA BAY by four big canoes from AUSRARA by THEODORE of S. BAY.’ ¶ Messages sent: ¶ 18th: RADIO to SECBRIG: ‘TEBBS at TUNKI 14th, EDSON at WASPUC 12th. Is northern area pushing small parties bandits reported headed down WANKS? Is HART pushing band east reported at YAUSCA?’ ¶ 19th: Radio to SECBRIG: “Patrol from EL GALLLO to TUNGLA on PRINZAPOLKA, ALMKANBAN about six miles up river, returned GALLO 18th. MATTESON believes section clear of arms. No bandit activity. TEBBS moving on BONANZO Mine from TUNKI.’ ¶ 20th: Radio to CO BLUEFIELDS: ‘Bandits in force in PIS PIS coming this way. Reenforce EL GALLO at once.’ ¶ 21st: Radio to EL GALLO: ‘Reports from several sources bandits in PIS PIS this week headed this way. Apparently two or more parties. TEBBS withdrawn here. Reenforcementes ordered to you from BLUEFIELDS. Keep me advised rumors and facts.’ ¶ 21st: Message to WANKS PATROL: ‘Three hundred bandits reliably reported digging in around NEPTUNE and EDEN Mines on north bank of TUNKI RIVER about nine miles north west of TUNKI. Our mission to prevent outlaws obtaining supplies or reenforcements. TEBBS has returned. Aerial reconnaissance ordered as weather permits basing on JINOTEGA.’ ¶ 21st: Radio to SECBRIG: ‘Company Engineer, former officer, reports from camp on KUKALAYA River, about twenty-five miles north east of TUNKI 2030, 19th: ‘Reliable information received from NEPTUNE MINE hear SANN PEDRO that total number of bandits is about three hundred. They are digging in around Mine Area. Area shown in sketch is NEPTUNE and EDEN mining area on north bank, TUNKI River, nine miles northeast of TUNKI. Have one over one hundred twenty thousand map positions of area. Request plane land here earliest good weather.’ ¶ HAROLD H. UTLEY, ¶ Major, U.S. Marine Corps. ¶ Commander, Eastern Area, Nicaragua." Intelligence Report, Eastern Area, Major H. H. Utley, Puerto Cabezas, p. 1. "(A) GENERAL STATE OF TERRITORY OCCUPIED: ¶ a. Conditions in Eastern Area: Conditions unsettled in the western part of the area probably due to reported looting at La LUZ and SANG SANG. ¶ b. Conditions in the coast towns tense. ¶ c. From all reports conditions around EL GALLO apparently quiet. ¶ (B) ATTITUDE OF CIVIL POPULATION TOWARD MARINES: ¶ Spanish not favorable, but not openly antagonistic; Indians and Jamaicans very friendly. ¶ (C) ECONOMIC CONDITIONS: ¶ The economic condition continued good. ¶ (D) POLICE OPERATIONS: ¶ Local Chief of Police cooperating with marines in maintaining order. ¶ (E) MILITARY OPERATIONS: ¶ a. Reliable information form Mr. AMPHLETT, manager of LA LUZ Mine that one hundred fifty mounted bandits, well armed but short ammunition, with two machine guns, one Lewis, one another make on tripod, with plenty of food arrived LA LUZ Mine twelfth from WANI looking for AMPHLETT. Took all money, gold amalgam supplies, eleven mules and saddle equipment giving authorized seizure. Considerable looting. Commanders: General GIRON, GUATAMALAN; SANCHEZ, believe to be Mexican; Captain ALTERMARANO, notorious HONDURAN revolutionist. Got over fifty NICARAGUANS in band. Many very young. Had written orders from SANDINO to make raid. Refused to state where he was, but one stated expected to meet him over here. . . . "
Intelligence Report, Eastern Area, Major H. H. Utley, Puerto Cabezas, p. 2. " . . . Took MARSHALL, Assistant Manager with them as prisoner. No further news of him. Went to NEPTUNE Mine evening thirteenth. Claimed to be going to PUERTO CABEZAS and would return later. Apparently took no other prisoners, but obtained some recruits. ¶ b. All information indicates this band is that reported by Brigade 18th as at TUMA and 21st at YAUSCA. It is evident that they have shaken off the pursuit of the marines reported 18th established at TUMA. It appears that they are seeking arms, ammunition, supplies and recruits. It is not believed they will be able to obtain any great number of arms nor any large amount of ammunition in this sector unless they can have them smuggled in. The obtaining of supplies as long as they remain in the mining area presents few difficulties especially since they will be able to with the help of Mr. MARSHALL to obtain gold from the NEPTUNE Mine with which to pay for produce obtained. They should have no difficulty in obtaining recruits in this sector where the prevailing sentiment is pro-Sandino. 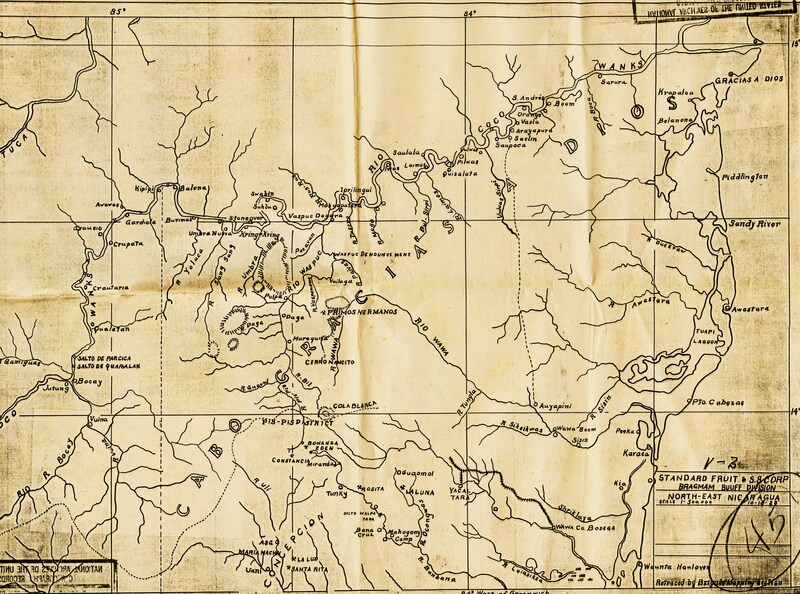 ¶ c. Two plans appear open to the bandits: ¶ (1) To obtain all possible reenforcements and supplies and return to the interior either via the route by which they came or via the cattle trail (not shown on any map), GUABUL Creek, BOCAY and COCO Rivers. ¶ (2) To use their present position as a base from which to operate in this area. The present position is believed to be tactically strong but strategically weak. ¶ d. Captain EDSON’s patrol still operating in the WANKS River district. No reported contact with armed bands. ¶ e. 15th: WANKS River patrol established outpost at SANG SANG. ¶ f. 19th: WANKS River patrol established outpost at WASPUC. ¶ g. 20th: Captain TEBBS patrol returned from TUNKI. No contact with armed bands. Rumors that bandits were in PIS PIS Area, but reconnaissance failed to locate them. ¶ h. 20th: At 2300 Captain TEBBS with patrol of twenty-four men left for BROWN’S CAMP for reconnaissance duty and preservation of order on line. ¶ HAROLD H. UTLEY, ¶ Major, U.S. Marine Corps, ¶ Commander, Eastern Area, Nicaragua." 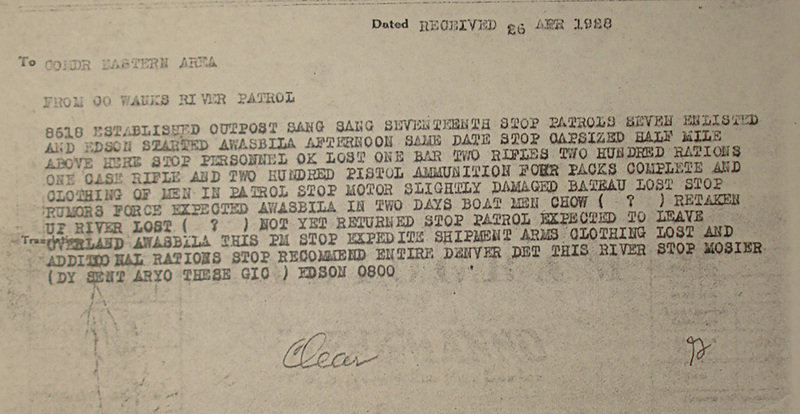 Intelligence Report of Incidents, Lt. H. J. Smith, for Major A. B. Sage, Bluefields. "(a) General State of Territory Occupied. (Bluefields). ¶ Quiet. Some talk among the people relative to a move to the coast by Sandinista forces. Also rumors about the starting of a revolution in Honduras in the near future and the possibility of some of the Sandinistas joining in the move. These topics are discussed along the streets and in the hotels as a general subject and to date no authoritative or authentic information is available. ¶ (b) Attitude of the Civil Population toward the Guardia. ¶ Favorable. The training of the recruits for the Guardia here has elicited favorable comment. ¶ (c) Economic Conditions. ¶ Favorable. Plenty of employment by the fruit and lumber companies. Prices of foodstuffs remain high. ¶ (d) Police Operations, Civil. ¶ Routine arrests, no serious crimes. ¶ (e) Friction between the Civil Population and the Gaudier. ¶ None. ¶ (f) Military Operations, Guardia. ¶ None. Area Commander on recruiting and reconnaissance mission to Puerto Cabezas. ¶ (g) Political Situation. ¶ Quiet. ¶ Miscellaneous. ¶ Twenty seven recruits under instruction. Preliminary range instruction under way and firing will commence during the coming week. It is believed that there will be sufficient men properly instructed and indoctrinated to allow the police of Bluefields being taken over about May 1st. ¶ H. J. Smith, ¶ Lieutenant, Guardia Nacional. ¶ For and in the absence of Major, AB/ Sage, GN. ¶ Area Commander." Radiogram from Gen. Feland, Managua, to Major H. H. Utley, Puerto Cabezas. "USS CLEVELAND BRINGING TO YOUR AREA FOLLOWING MARINES SEVEN OFFICERS INCLUDING CAPTAIN ROSE AND TWO HUNDRED MEN COMMA ONE DOCTOR AND FOUR CORPSMEN STOP REQUEST YOUR RECOMMENDATION AS TO DISTRIBUTION STOP KEEP BRIGADE FULLY INFORMED AND CONTINUE MISSION AS ASSIGNED IN MY EIGHTY SIX TWENTY ONE DASH ONE SIX ONE THREE STOP FOR TECHNICAL REASONS RECONNAISANCE FROM WESTERN NICARAGUA IS IMPRACTICABLE STOP I AM ENDEAVORING TO GET LATEST TYPE OF AMPHIBIAN PLANES AND PLANNING TO BASE SOME AT PUERTO CABEZAS STOP FELAND 1233." Radiogram from Major H. H. Utley, Puerto Cabezas, to Gen. Feland, Managua. "YOUR EIGHT SIX TWENTY THREE TEN TWENTY TWO AMPHLETT MANAGER LA LUZ MINE HERE TODAY STOP WENT TO MINE AFTER BANDITS LEFT FOR NEPTUNE MINE STOP HIS EMPLOYEES INFORMED HIM ONE HUNDRED FIFTY MOUNTED BANDITS WELL ARMED BUT SHORT AMMUNITION WITH TWO MACHINE GUNS COMMA ONE LEWIS ONE ANOTHER MAKE ON TRIPOD COMMA WITH PLENTY OF FOOD ARRIVED LA LUZ MINE TWELFTH FROM WANI LOOKING FOR AMPHLETT STOP TOOK ALL MONEY COMMA GOLD AMALGAM COMMA SUPPLIES COMMA ELEVEN MULES AND SADDLE EQUIPMENT GIVING RECEIPT FOR AUTHORIZED SEIZURE STOP CONSIDERABLE LOOTING STOP COMMANDERS GENERAL GIRON GUATAMALAN COMMA SACHEZ BELIEVED TO BE MEXICAN COMMA CAPT ALTERMANO [ALTAMIRANO] NOTORIOUS HONDURANIAN REVOLUTIONIST STOP NOT OVER FIFTY NICARAGUANS IN BAND STOP MANY VERY YOUNG STOP HAD WRITTEN ORDERS FROM SANDINO TO MAKE RAID STOP REFUSED TO STATE WHERE HE WAS BUT ONE STATED EXPECTED TO MEET HIM OVER HERE STOP TOOK MARSHALL ASST MANAGER WITH THEM AS PRISONER STOP NO FURTHER NEWS OF HIM STOP WENT TO NEPTUNE MINE EVENING THIRTEENTH STOP CLAIMED TO BE GOING TO PUERTO CABEZAS AND WOULD RETURN LATER STOP APPARENTLY TOOK NO OTHER PRISONERS BUT OBTAINED SOME RECRUITS STOP 2000"
"APARECEN REVOLTOSOS EN PISPIS," La Noticia, Managua. "Saquearon las minas de aquel pueblo. ¶ El Recaudador General de Aduanas, Mr. Ham recibió el siguiente radiograma del Administrador de Puerto Cabezas. ¶ 'Las dos minas de Pis Pis fueron saqueadas por los rebeldes hace algunos días. Se informa que fueron capturados dos americanos por los rebeldes'. ¶ Las minas de Pis-Pis, son famosas y ricas. Quedan en el distrito de Prinzapolka, casi en la frontera con la comarca del Cabo, y cerca de las minas Bonanza y otras." Radiogram from Major H. H. Utley, Puerto Cabezas, to Gen. Feland, Managua. "8624 YOUR EIGHT SIX TWO THREE DASH TWELVE THREE THREE RECOMMEND ENTIRE FORCE DISEMBARK HERE STOP ALL INFORMATION INDICATES TWO BANDS EACH ONE HUNDRED FIFTY STRONG MOUNTED COMMA WELL ARMED COMMA SHORT AMMUNITION COMMA TWO MACHINE GUNS COMMA UNITED IN AREA NEPTUNE MINE DASH LONE STAR MINE WHERE THEY ARE ENTRENCHING AND WORKING MINE STOP BEST ESTIMATE BAND NUMBERS FOUR HUNDRED STOP FOOD PLENTIFUL STOP GEN GIRON GUATAMALAN COMMA GEN PLATA NICARAGUAN COMMA COL SANCHES PROBABLY MEXICAN COMMA CAPT ALTAMIRANO HONDURANIAN PROMINENT OFFICERS PRESENT STOP INDIANS STATE OTHER BANDS COMING DOWN WANKS AND WASPUC TO PIS PIS STOP CAN NORTHERN AREA BLOCK EXIT UP WASPUC DOWN KULI CREEK OR PARALLEL TRAIL TO EAST COMMA TO BOCAY RIVER QUESTION EDSON BLOCKS EXIT TO NORTH COMMA TEBBS ON TRAIL COMMA MATTESON HOLDS GALLO AND SCOUTS TOWARD LA LUZ STOP 0200"
Radiogram from Capt. D. J. Kendall, Puerto Bluefields, to Gen. Feland, Managua. "8624 YOUR 8623 JIRON WITH TWO HUNDRED ARRIVED LA LUZ MINE EVENING TWELFTH STOP THAT NIGHT AND ALL NEXT DAY TOOK ALL MONEY GOLD AMALGAM MERCHANDISE LIVE STOCK EMPLOYEES AND GEORGE B MARSHALL THE ACTING SUPERINTENDENT STOP THEY LEFT EVENING THIRTEENTH FOR NEPTUNE MINE THEY SAID ON WAY TO PUERTO CABEZAS AND STATED THEY WOULD RETURN AND DO WORSE DAMAGE EVENING OF FIFTEENTH RUNNER ARRIVED FROM OVERLAND ROUTE TO MATAGALPA SAYING FORCE TWO HUNDRED EIGHTY MORE SANDINISTAS ON WAY OVER KILLING ALL PEOPLE MEN WOMEN AND CHILDREN AND BURNING HOUSES AND THEY MAY REACH LA LUZ FOURTEENTH STOP SOURCE OF INFORMATION LETTER TO BLUEFIELDS MERCANTILE COMPANY FROM A H BROWN AUDITOR AT MINE VERIFICATION VERBAL REPORTS FORM NATIVES WHO FLED PIS PIS AREA AFTER BEING WARNED BY RUNNERS THAT BANDITS HAD BEEN AT LA LUZ AND WERE IN LIMON FOURTEENTH STOP REPORT BELIEVED CORRECT STOP RUMORS REGARDING BANDITS CROSSING RIO GRANDE TO KURRING WAS NEAR MACANTACA BELIEVED UNTRUE KENDALL 0845"
Radiogram from Capt. D. J. Kendall, Bluefields, to Major H. H. Utley, Puerto Cabezas. "UNION DID NOT SAIL STOP CARROLL SAILING TODAY ON ANDERSON STOP ACCOUNTING SUFFICIENT EFFECTIVE HERE TO CLOSE RIVER HAVE ISSUED RIFLES TO COMMANDANTES AT RAMA AND GUADALUPE WITH INSTRUCTIONS TO CLOSE RIVER AND MAINTAIN ORDER INFORMING ME IMMEDIATELY ANY DEVELOPMENTS IN THEIR AREAS STOP HAVE ORDERED RIO GRANDE BAR TO WATCH ROUTES UP RIVERS AND WATCH BEACH TO PRINZAPOLKA COMMA PREVENT SMUGGLING ARMS AND AMMUNITION AND RADIO INFORMATION ON BANDIT MOVEMENTS RECEIVED THERE STOP EXPECT NEW RADIO SETS SATURDAY AND INTEND INSTALLING ONE IN BLUEFIELDS AND TAKE MARINES OUT OF BLUFF LEAVING THAT PLACE TO GUARDIA IN ORDER TO ECONOMIZE MEN AND SAVE TIME IN COMMUNICATION STOP SENT ONE NEW OUTBOARD MOTOR TO EL GALLO SATURDAY AND HAVE TWO HERE QUESTION WILL YOU WANT THEM FOR USE PRINZAPOLKA STOP WE CAN GET ALONG WITH ONE HERE AND EL GALLO CAN GET BOATS FROM COMPANY KENDALL 0900"
Radiogram from Capt. D. J. Kendall, Puerto Bluefields, to Gen. Feland, Managua. "8625 YOUR 8624 1900 IS REFER ORDER RECEIVED HERE NO REPEAT NO ¶ 8622 1300 REPETITION RECODED [sic] FOLLOWS TWO HUNDRED BANDITS SACKED LA LUZ MINE 17th STOP BANDITS STATED ONE HUNDRED EIGHTY MORE WERE COMING STOP ABOUT HALF WAY ON TRAIL FROM ALAMICAMBA PRINZAPOLKA IF TO SIUNA ON MORNING OF SEVENTEENTH SOME KHAKI CLAD SOLDIERS NOT AMERICANS WERE SEEN WITH SIX CARGO BULLS AND OTHER SOLDIERS WERE SEEN COMING OUT OF BUSH WITH HEAVY BOXES PROBABLY AMMUNITION STOM ALAMICAMBA BELOW TUNGLA ON PRINZAPOLKA WAS HEADQUARTERS OF MONCADA AFTER PRIZAPOLKA A NEUTRAL ZONE STOP MONCADA BELIEVED TO HAVE BURIED ARMS AND AMMUNITION HE TOOK OUT OF PRINZAPOLKA NEAR ALAMICAMBA stop TRAIL FROM THERE TO SIUNA N TWO DAYS AND LA CRUZ TWO DAYS STOP COMMISSARY AT ALAMICAMBA AND GARCIA CATTLE RANCH NEARBY STOP PINE COUNTRY EASY HIKING FROM THERE TO RIO GRANDE STOP ON 14th FIFTY BANDITS ARRIVED LIMON THE PIS PIS AND STATED OTHERS WERE COMING FROM SIUNA STOP ALL FOREIGNERS FLED TO BUSH OR DOWN RIVER EXCEPT A FEW NAMES UNKNOWN WHO WERE CAPTURED STOP MINES SACKED AND INHABITANCE THAT AREA TOOK TO BUSH STOP AT NOON NINETEENTH ABOUT FIFTY BANDITS SEEN CROSSING FROM TUNKI TOWARD CUCALAYA EVIDENTLY STRIKING TOWARD WAKIWAS AND PUERTO CABEZAS TRAILS STOP THIS UNVERIFIED INFORMATION OBTAINED BY OLFARO COMMANDANTE AT PRINZAPOLKA BAR FROM SPIES HE SENT OUT STOP BELIEVED FAIRLY RELIABLE UNVERIFIED RUMORS HERE THAT BANDITS HAVE COME DOWN MACANTACA CREEK AND CROSSED RIO GRANDE TO KURRING WAS RIVER KENDALL 1800"
Radiogram from Major H. H. Utley, Puerto Cabezas, to Gen. Feland, Managua. "8625 YOUR 8625 AMPHLET MANAGER LA LUZ MINES HERE TODAY STOP WENT TO MINE AFTER BANDITS LEFT FOR NEPTUNE MINE STOP HIS EMPLOYEES INFORMED HIM ONE HUNDRED FIFTY MOUNTED BANDITS WELL ARMED BUT SHORT AMMUNITION WITH TWO MACHINE GUNS COMMA ONE LEQIS ONE ANOTHER NAME TRIPOD COMMA WITH PLENTY OF FOOD ARRIVED LA LUZ MINE TWELFTH FROM WANI LOOKING FOR AMPHLETT STOP TOOK ALL MONEY GOLD AMALGAM SUPPLIES ELEVEN MULES AND SADDLE EQUIPMENT GIVING RECEIPT AUTHORIZED SEIZURE STOP CONSIDERABLE LOOTING STOP COMMANDERS GENERAL GIRON GUATAMALAN COMMA COLONEL SANCHEZ BELIEVED TO BE MEXICAN COMMA CAPTAIN ALTERMARANO NOTORIOUS HONDURAN REVOLUTIONIST STOP NOW OVER FIFTY NICARAGUAN MEN STOP MANY VERY [?] STOP HAD WRITTEN ORDERS FROM SANDINO TO MAKE RAID STOP REFUSED TO STATE WHERE HE WAS GOING STATED HE EXPECTED TO MEET HIM OVER HERE STOP TOOK MARSHALL ASSISTANT MANAGER WITH HIM AS PRISONER STOP NO FURTHER NEWS OF HIM STOP WENT TO NEPTUNE MINE EVENING THIRTEENTH STOP CLAIMED TO BE GOING TO PUERTO CABEZAS AND WOULD RETURN LATER STOP APPARENTLY TOOK TWO OTHER PRISONERS BUT RETAINED SOME RECRUITS STOP 2000"
"The Gold Mine in Central Nicaragua which has been Seized by the Rebel Leader, Sandino," The Evening Bulletin, Philadelphia PA, p. 1. "The Gold Mine in Central Nicaragua which has been Seized by the Rebel Leader, Sandino,” The Evening Bulletin, Philadelphia PA, p.1. “On the Banban River--The pitpan, the boat shown in the picture, is made from a single log of a tree hollowed out. It is the sole means of bringing in supplies to the gold mining district in which four Americans have been captured. ¶ The Hydro-Electric Power Plant that supplies power to the district. These pictures were taken by Wharton Huber, associate curator in charge of birds and mammals at the Academy of Natural Sciences, 19th st. and the Parkway, while on an expedition in the section now held by the rebel chieftain." "The Gold Mine in Central Nicaragua which has been Seized by the Rebel Leader, Sandino," The Evening Bulletin, Philadelphia PA, p. 2. "The Staff House of the Eden Mines owned by Benjamin C. Warnick, 1218 Locust St., himself at one time captured in Nicaragua by rebels. Wharton Huber, who made these pictures, says that after 180 miles traveling through the jungles, it seemed a most palatial dwelling. ¶ Only Road Through Pispis Mining District of Nicaragua. This mere trail is up to the waist of a man deep in mud during the rainy season which is now starting. The even mounds are made by horses and oxen who step into the same ruts." 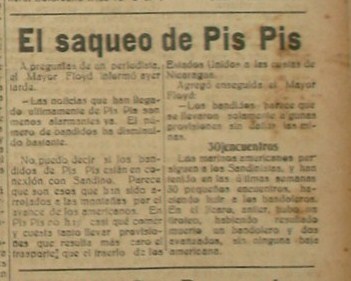 "El saqueo de Pis Pis," La Noticia, Managua. "El saqueo de Pis Pis ¶ A preguntas de un periodista, al Mayor Floyd informo ayer tarde. ¶ -Las noticias que han llegado últimamente de Pis Pis son menos alarmantes ya. El numero de bandidos ha disminuido bastante. ¶ No puedo decir si los bandidos de Pis Pis están en conexión con Sandino. Parece que son esos que han sido arrojados a las montañas por el avance de los norteamericanos. En Pis Pis no hay casi que comer y cuesta tanto llevar provisiones que resulta más caro el transporte que el traerlo de los Estados Unidos a las costas de Nicaragua. ¶ Agregó enseguida el Mayor Floyd: ¶ Los bandidos parece que se llevaron solamente algunas provisiones sin dañar las minas. ¶ 30 encuentros ¶ Los marinos americanos persiguen a los Sandinistas y han tenido en las últimas semanas 30 pequeños encuentros , haciendo huir a los bandoleros. En el Jícaro, antier, hubo un tiroteo, habiendo resultado muerto un bandolero y dos [avanzados], sin ninguna baja Americana." 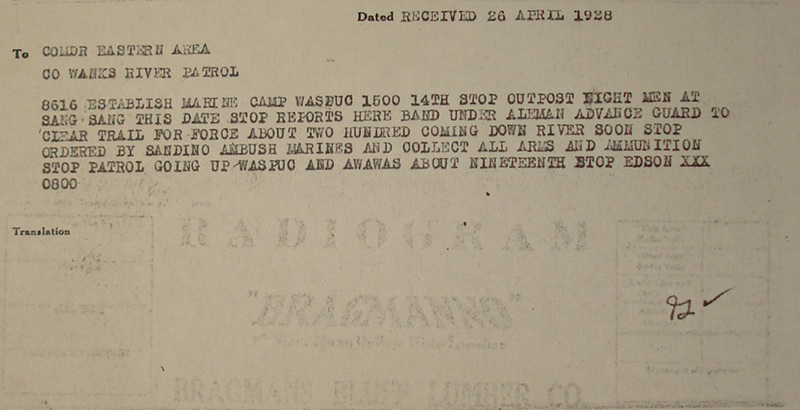 Radiogram from Major Hans Schmidt, Managua, to Major H. H. Utley, Puerto Cabezas. "8626 RUMOR HERE THAT JIRON WITH ONE HUNDRED FIFTY MEN WENT DOWN PRINZAPOLKA RIVER STOP SCHMIDT 0942"
Radiogram from Gen. Feland, Managua, to Major H. H. Utley, Puerto Cabezas. "8625 THREE PLANES TODAY RECONNOITERED PIS PIS AREA FROM JALAPA STOP FOLLOWING PLACES APPEARED NORMAL COLON POTECA RIVER COMMA COCO RIVER COMMA BOCAY RIVER COMMA AULI RIVER COMMA TUNKUN RIVER COMMA SAN PEDRO COMMA BONANZA MINE COMMA BODEGA COMMA CONSTANCIA COMMA OIRANDA COMMA EDEN COMMA YAPUWA COMMA ULMUCWAS AND BURIMA STOP ALL MINES APPEARED TO BE IN HANDS OF CARETAKERS STOP VILLAGES APPEAR TO HAVE ONLY USUAL NUMBER OF PEOPLE STOP NO SIGNS OF OUTLAWS NOTED STOP VERY SMALL AMOUNT OF CULTIVATED LAND STOP AREA EXTREMELY HAZARDOUS FOR FLYING STOP FELAND 2003"
Radiogram from Gen. Feland, Managua, to Major H. H. Utley, Puerto Cabezas. "8625 FOR MAJOR UTLEY STOP COMSPERON INFORMS BRIGADE WILL KEEP TWO SHIPS ON EAST COAST FOR PRESENT TO PATROL ALL STREAMS AND PROVIDE BOATS FOR MARINES IN SUFFICIENT NUMBERS TO ATTACK EVERYWHERE EVER FOUND STOP FELAND 2053"
"El asalto de los Minerales de Pis-Pis - Protestan las Compañías ante el Jefe Político de Bluefields," La Noticia, Managua. "Las compañías propietarias de los minerales ‘La Luz’, ‘Los Angeles’ y ‘Bonanza’ situados en el distrito de Prinzapolka, enviaron al Jefe Político de Bluefields, general Juan J. Estrada, una protesta por el asalto, saqueo y captura de empleados, hecho por un grupo de rebeldes en los citados Minerales. El general Estrada trascribió la protesta al Presidente Díaz."